It's funny how some models were made for years and years (like the Boulton) but others appeared for only a single year. It sort of makes you wonder how these decisions were made. Was there one guy calling all the shots? Did they poll focus groups of jewelers? Did they have a long term strategic plan and one-year wonders filled in gaps? Maybe it was all of the above. 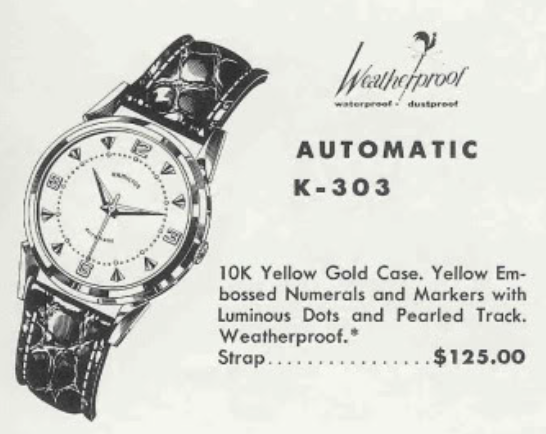 In any event, there are a bunch of one year wonders throughout the 50 or so years of wrist watch production in Lancaster PA. One of the 1960 models was the Automatic K-303. The Automatic series was nearing the end of it's run, and was about to give way to the Accumatic line. So that may be one reason why the model was produced only a single year. I like the Automatic K watches from the 1960's. They are substantial watches and the K-303 is a nice example. Being part of the 300-line, it comes in a solid 10K yellow gold case. It has a bold-looking dial with embossed numerals and markers. Tucked inside the K-303 is a Hamilton 661 automatic movement... a workhorse of a movement that was used is just about all of the K-series watches. My project watch came courteous of a fellow collector friend of mine. It was a new addition for him and looks to be in great shape but like all "new purchases", if you don't know when it was last cleaned it's prudent to get it overhauled before wearing it. Watches have a tiny amount of oil inside and over a few year it will evaporate. Wearing a watch without oil will cause unnecessary wear and tear. So even though a watch runs, it's a good idea to maintain it every 3-5 years. The back of the K-303 is solid 10K gold too. This case back is a little unusual, it has two parts. The back cover is held on by a thin ring. Here's a better shot of the back and the ring. I don't care for this design, especially on solid gold models, because the ring is rather delicate. I have found models with this sort of design can be very stubborn to open. If you look at the movement above, it's nice and shiny looking but that doesn't mean that it's clean. Notice how dirty the cleaning solution got after a few minutes in the ultrasonic machine. I'm always amazed at how dirty a clean-looking watch can really be. All the parts have been cleaned, rinsed twice and then dried before being reassembled with four different lubricants. The fast shutter speed of my camera makes the watch look like it's not running - but it's actually ticking away nicely now. The oscillating weight and it's carrier are not installed yet - so this is basically a manual-winding movement at the moment. However, now is a good time to put it on the timer to see how it's running. Not too shabby, a slight tweak of the regulator adjustment screw will speed the watch up 9 seconds per day. Well, this watch looks as good as it did when it arrived but now it can be worn without worrying about whether there is oil inside. It's a very nice looking watch in my opinion, I'm sure my friend will be glad to have it come home. thank you for creating an amazing and detailed site - its beyond awesome!